Rather, Hallowe’en, for me, is more about how children change into little candy-devouring monsters. For the parents reading this, the transformation is more apparent; we indulge our little ones this night, allowing them to stay up late, to eat things they probably ought not to, and do the same for others. Somehow a veneer of monsterhood changes a child’s apparent properties, even though it’s still a child under the mask. Like so many things in life, changes in kind weirdly applies to Magic. What do I mean by changes in kind? I mean that if you change a card’s type, you can begin to have all sorts of fun with it. Type-changing cards are among my favourites. I have a kind of glee about the silly possibilities afforded by type-changing effects. Best of all, type-changing has real and effective application in Elder Dragon Highlander, where the best way to win is the one you find the coolest. One of the oft-cited difficulties for mono-red is enchantment destruction. In my own red deck, I tried many brute force methods of destroying enchantments. Steel Hellkite, Spine of Ish Sah, Karn Liberated, and Argentum Armor were all lined up alongside Chaos Warp. But, excepting Chaos Warp, they were all so expensive. Then, I remembered: Liquimetal Coating. Red can destroy artifacts in more ways than any other colour. Creatures with activated abilities, creatures with triggered abilities, artifact destruction cantrips, spells with Cycling, Replicate, Recover, Buyback, Flashback, and now, Overload. You name it, red has it. With all those Sol Rings, Lightning Greaves and other equipment kicking around, it makes a fair bit of sense to run a lot of artifact hate. Liquimetal Coating turns all your artifact destruction into destruction for any kind of permanent. You could also run Mycosynth Lattice, but I find people hate that one for combo and land destruction reasons, while Liquimetal Coating is just innocuous enough for people to leave alone. Black has only one legitimate artifact destruction card: Gate to Phyrexia. Yet, black has nearly as many ways of destroying creatures as red does artifacts. In the same style as Liquimetal Coating, Xenic Poltergeist does good work for mono-black. Black has so many efficient ways of destroying creatures that Xenic Poltergeist converts all your creature destruction to artifact destruction. Xenic Poltergeist has strength even in his own right; he can cause equipment to become a creature, which forces it to become unequipped (that’s rule 301.5c), removing Lightning Greaves so you can kill a protected creature, locking out Skullclamp each turn, or even destroying cards like Darksteel Forge with sacrifice effects like Diabolic Edict. Additionally, you can transform your own artifacts, like Spine of Ish Sah, into a powerful creatures. It also helps that he can draw you two cards with Skullclamp. Titania’s Song operates as blanket permanent Artifact hate. Since artifacts lose all their abilities, Titania’s Song effectively makes most mana rocks, including Sol Ring, worthless, and ruins some sweepers like Oblivion Stone and Nevinyyral’s Disk. Further, it can shut down cards like Darksteel Forge whose abilities are static, and otherwise incredibly difficult to interact with. I recall hating this card when I opened it in fourth edition packs, but did not make the connection to use it against the Cursed Scroll decks that would run rampant later. 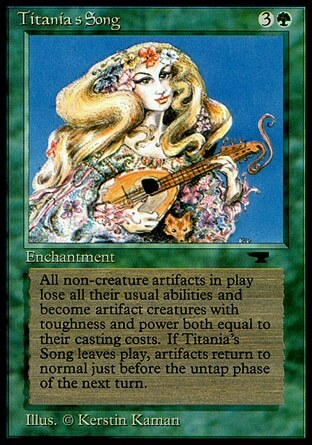 Unlike Titania’s Song, Mycosynth Lattice, is a known combo piece. It has the same applications as Liquimetal Coating, but with none of the subtlety, and certainly much more hate. Karn, Silver Golem could destroy lands, paired with Titania’s Song, all lands would be destroyed and no new ones could be played without immediate destruction, and cards like Null Rod could shut down all lands and other activated abilities. Most notoriously, Mycosynth Lattice was used with Darksteel Forge and Nevinyrral’s Disk to destroy all opponent’s permanents while keeping your own. If you’re interested in social play, this might be one to avoid, or to be very carefully played with. For example, an Overloaded Vandalblast or Hurkyl’s Recall will not make people like you more. Much like Mycosynth Lattice, Enchanted Evening has some real potential to mess up the game. Aura Thief, Calming Verse, and Primeval Light can create negative play experiences, even if they expand many kinds of white and green removal to encompass everything. Just as Titania’s Song and Mycosynth Lattice create a prisoner’s kind of board state, Opalesence does the same, though at least does not remove abilities from each permanent. Living Plane and Nature’s Revolt are the final cards. For these, there are plenty of proactive plays you can make with them. Linvala, Keeper of Silence locks opponents’ lands out of creating mana, and plain old removal will destroy lands. These enchantments themselves deter sweepers that include creatures. If you’re especially brave, Sean Patchen, AKA Swordstoplow wrote an article that uses lands to win the game through the redzone. Type changing cards can provide a lot of fun. Timber Protector with Life and Limb can make your forests into indestructible 2/2 creatures, which is fun, but it’s easy to slip past the fun trick-or-treating kind of type manipulation, and slide into real difficulty with mass land destruction, bounce or other sorts of permanent denial. On the one hand, I love type-changing cards because they let you do something new, and universally will create more options, and on the other, I fear that they will almost always degenerate into mass land/permanent destruction.